Henna is inked onto the skin in a design with a special applicator pen. Henna colors range from light brown to a dark red brown. 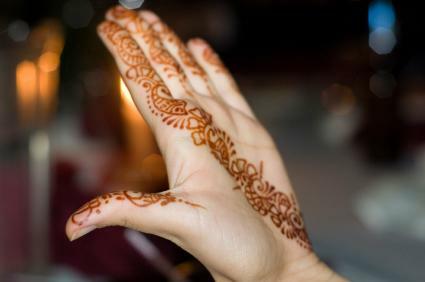 Henna in any other color is not pure henna and may be harmful to the skin and cause blistering. To achieve variety in color, henna tattoo artists steam the henna dyed skin or leave the dye on for varying lengths of time. Henna tattoos fade naturally over time as the skin sheds and sloughs off; this is the normal method of henna tattoo removal. Wash the area or rub it more often to speed up the skin sloughing process and tattoo fading. Early henna removal is fairly easy because henna only colors the top layer of skin. Those who want their henna tatoo to last for the maximum amount of time should do just the opposite. If you avoid washing the tattoo, it can last as long as a couple of months. Following are several effective methods for removing a henna tattoo. Remove dead skin cells faster by exfoliating or scrubbing the skin. Use a mildly abrasive over-the-counter exfoliating cleanser with a loofah sponge. Scrub vigorously and rinse and repeat. Do this daily until the tattoo is gone. Soaking in water hastens the removal of a henna tattoo. Shower in hot water and scrub the tattoo with soap and a washcloth. Take a swim in a pool with chlorinated water; the chlorine will help fade the tattoo quickly. Sitting in a hot tub with hot chlorinated water works even quicker to fade the tattoo. As you sit in the hot tub, rub the tattoo with a washcloth or a loofah sponge. Apply hydrogen peroxide to a cotton ball and rub it on the henna tattoo. Apply hydrogen peroxide regularly until the tattoo disappears. Soak the tattoo in a bowl of warm salt water for about 30 minutes. Afterward, use a washcloth with soap and scrub the tattoo. If you decided to try a henna tattoo and now regret that decision, know that it will fade relatively quickly if you use the removal methods described above. However, if you need it gone now, the best advice is to cover it up. Henna tattoos cover up easier than regular tattoos. Simply use a thick pancake makeup that matches your skin tone or get a little creative with your clothing.